Stackable with the BOXX APEXX 1 workstation, renderPRO 1 is the world’s smallest rendering sidekick. Featuring an Intel® Xeon® processor (up to 22 cores), renderPRO 1 enables you to work while you render, without the cost or complexity of a render farm. Are You a Mark or a Mike? In a candid interview, Orange County Choppers senior designer Jason Pohl and media & marketing advisor Jim Kerr cut up and cut loose on the business, their workflows, and why the world’s most famous custom motorcycle shop is thrilled to be back with BOXX. renderPRO 1 is a complete computer powered by a single Intel® Xeon® processor (up to 18 cores, 36 threads) and up to 64GB of DDR4-2133 memory. We’ve stripped away the unnecessary features and boiled it down to what matters most: CPU core count. renderPRO 1 was designed for 24/7 maximum workload operation and to that end, we’ve engineered a cooling system that ensures cool, reliable performance and operation so quiet that you'll welcome it on your desk. The all-aluminum chassis was designed to sit directly atop our APEXX 1 and also allows it to be stacked several units high for a powerhouse, desk side, render farm solution. At BOXX, we understand your workflow and the professional software you rely on, so we design solutions (from the ground up) to run those applications at peak performance. This delivers genuine results that keep you creating and not waiting. 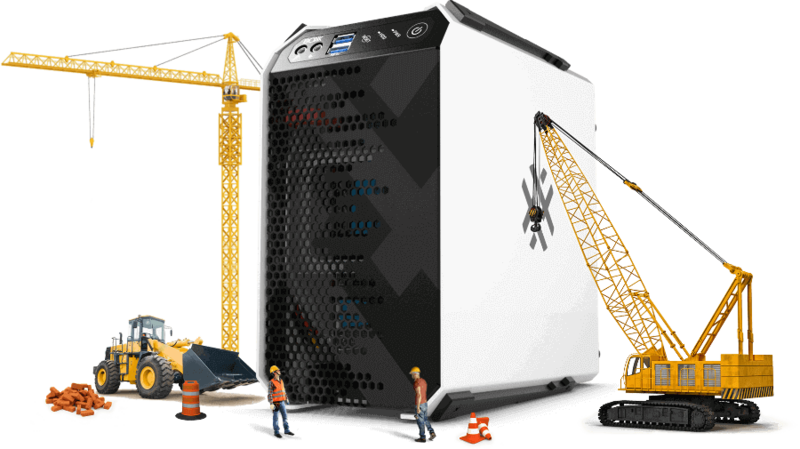 A renderPRO 1 portable render farm is the only desk side personal rendering and simulation solution designed for offloading computationally intensive tasks. Keep your workstation free for creating without bogging down your CPU. When combined with an overclocked workstation like APEXX 1, your workflow will soar with maximum performance regardless of whether you’re bottlenecked by frequency or the number of cores. Check out the overclocked workstation companion of renderPRO 1, APEXX 1, and stack one on another for space-saving power.